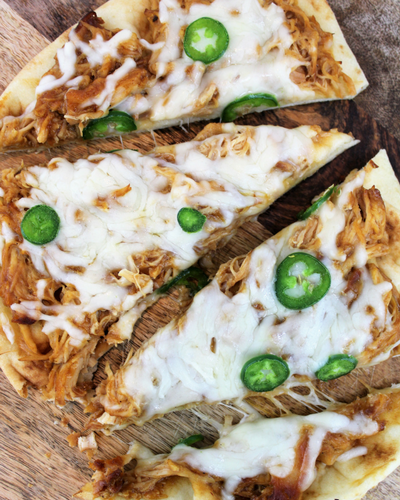 BBQ Chicken Naan Pizza has shredded chicken, barbeque sauce of your choice topped with cheese and jalapenos on naan bread. With Spring right around the corner, I am thinking about recipes that are simple with the busy season ahead. Even as it gets warmer outside, I still love my crockpot. I just start cooking lighter dishes in it. It is perfect for crazy days with baseball practice, school, work and everything in between. 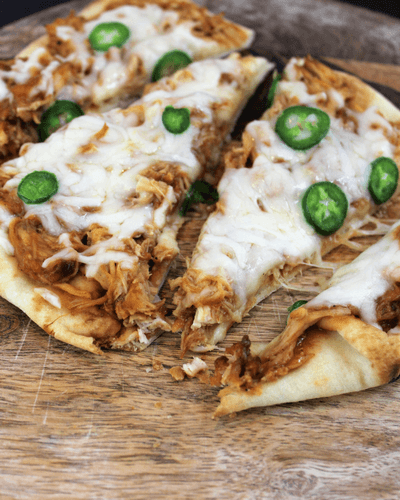 Throw some chicken in the crockpot in the morning and after school before busy activities, put together your naan pizzas and bake in the oven for 15 minutes. Easy as it can get. Feel free to make these naan pizzas customizable. Pick your favorite barbeque sauce and favorite cheese. Add vegetables and herbs. Tomato slices are delicious. We like buying the small naan breads so everyone can build their own and nobody can make a fuss. Place chicken in crockpot with 1 cup BBQ sauce. Cook on low 6 hours. 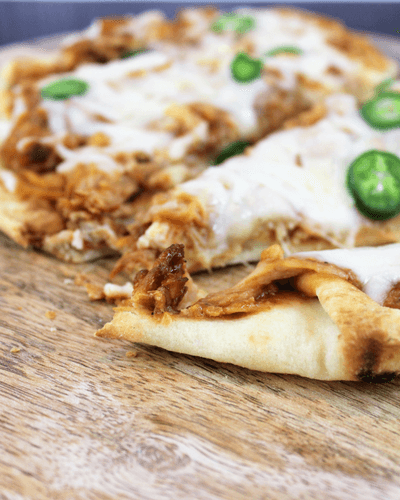 Shred chicken and place on naan bread. 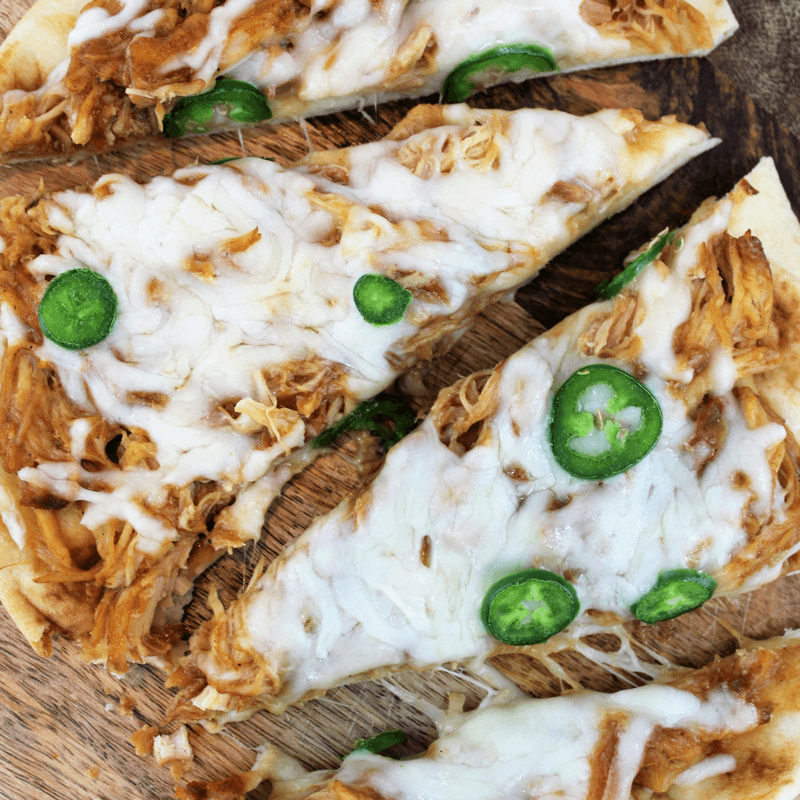 Finely slice the jalapeno and spread out on pizza. Bake in oven on 350 degrees for 15 minutes. Spicy Buffalo Honey Mustard Ham and Cheese Croissant is a simple lunch sandwich that is perfect for on the go busy people like myself. Start with a nice buttery, flaky croissant and add a few slices of black forest ham from the deli counter, a slice of pepper jack cheese, and spread a generous amount of our spicy buffalo honey mustard. Wrap the sandwiches up in foil and set in fridge. On the way out the door, grab a wrapped sandwich and heat up for 45 seconds at lunchtime. The kids take them to school and eat cold. This spicy buffalo honey mustard is amazing! There is a hint of barbeque sauce in the honey mustard and has just a little kick of spicy. So good and this sauce can be used with all sorts of foods… chicken tenders, french fries, on a salad, in a wrap, you name it. Before being a stay at home mom, I worked in a hospital. I know that many of you out there can relate to this schedule. 7:30am: start work. 10:00am: break if the stars are in proper alignment and a patient cancelled by chance. 12 noon: lunch. 12:20: actually able to sit down for lunch after catching up on morning work, 12:25: shove food in face because next patient is here but hey maybe it will be your lucky day and you can have a snack break before you leave at 4pm. Anybody relate? This is a perfect lunch time croissant, if you have THAT schedule or any other and ideal for kids lunch boxes. You can eat this sandwich cold or remove from foil and heat in the microwave for 45 seconds. Preparation is really easy and I make 8 on Sunday night and set into fridge for everyone to grab in the mornings through the week. Gather ingredients, cutting board, serrated knife, small bowl, spoon and foil. In the bowl, use your spoon to mix 1 cup honey mustard, 1/4 buffalo sauce and 1 tablespoon barbeque sauce together. Mix until completely blended for your spicy buffalo honey mustard spread. Take the croissants and cut each to open up. Layer croissants with 4-6 slices ham, 1 slice pepper jack cheese and desired amount of spicy buffalo honey mustard. Wrap each in foil and set in fridge. At lunch, unwrap from foil and eat cold or heat in microwave for 45 seconds.